Han Ting Zhou 韓庭州 (Map): It’s located right next to Mary Jane Pizza (see my previous review). The restaurant caters to students and locals that want simple but delicious food at an affordable price. There are not many Korean places in this area that are consistent with their opening days and times, but Han Ting Zhou is reliable. Since National Taiwan University (NTU) is right across from this place, expect a wait during peak hours for lunch and dinner, but don’t fret, the turnovers are quick — waiting time should be no more than 15 minutes, which gives you enough time to decide what you want to eat. There’s an English menu, but I don’t think it lists out all of their dishes — mainly the most popular and classic ones and you can’t go wrong with those. 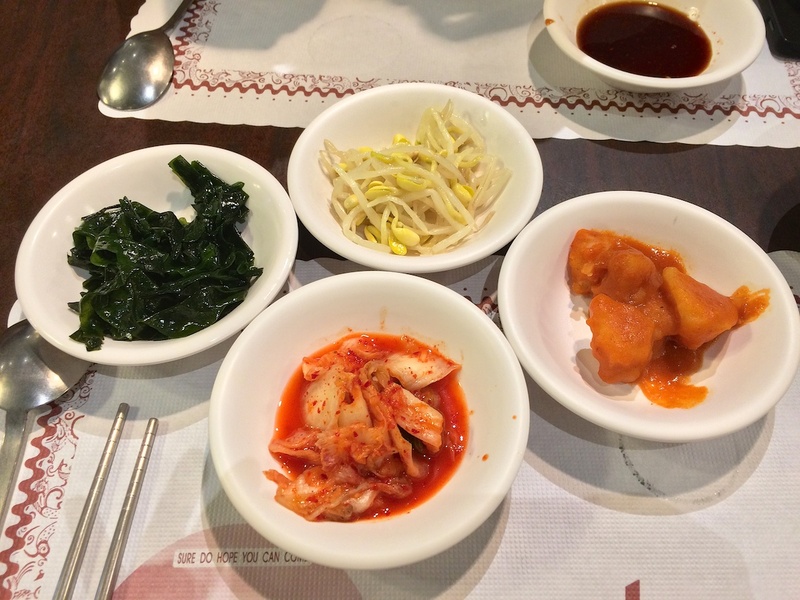 Side dishes “Banchan”:These 4 side dishes come standard and usually get to your table after you place your order. Not sure if these banchans change seasonally, but so far, they’ve been the same every time I’ve been here. The cabbage kimchi is well fermented while the braised potatoes are slightly sweet and super addictive. The seasoned seaweed is more salty than vinegary — personally, I like the vinegary taste more. The soybean sprouts are crunchy and not as seasoned as the other banchan, which balances out all the other colorful flavors from the other dishes. From Left going clockwise: Seasoned seaweed, soybean sprouts, braised potatoes, and cabbage kimchi. 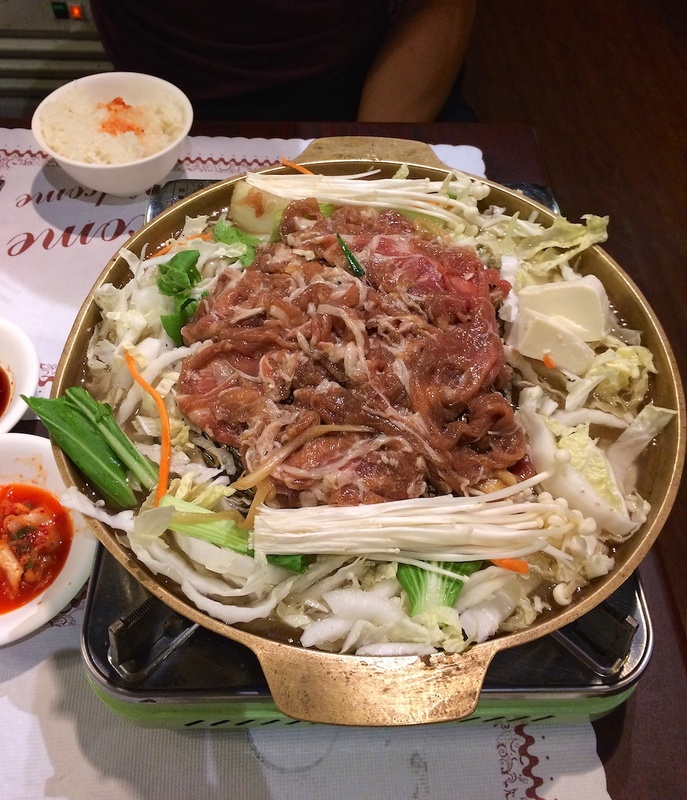 Main dishes: Bulgogi BBQ — comes in beef and pork — I like the pork better. 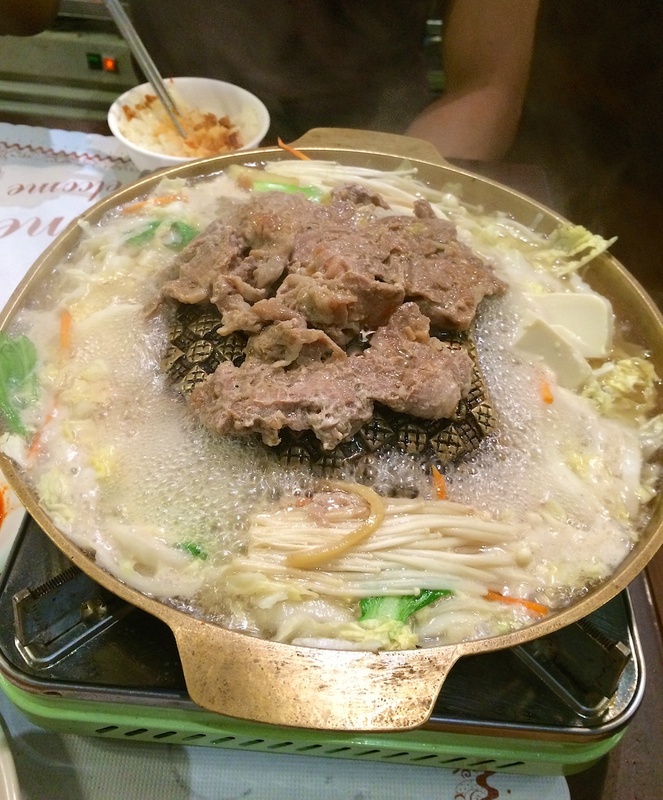 The middle of the pan is raised like a dome where the meat is placed. The juices from the meat runs down to the broth filled with fresh vegetables adding an additional flavor and making the soup rich and sweet. 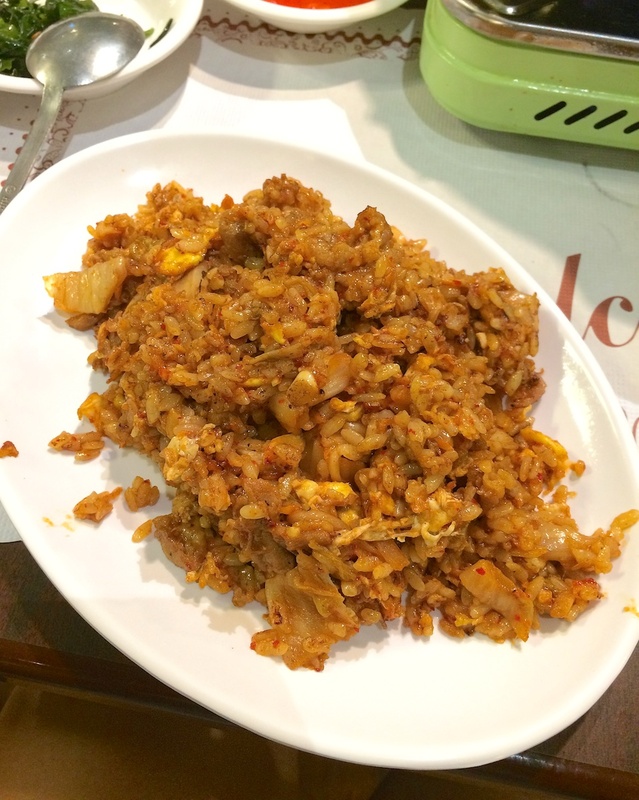 Kimchi Fried Rice: My favorite dish here! One of the best kimchi fried rice I’ve ever tasted. In one bite, you get a little bit of tangy sweetness from the kimchi and savory from the meat and egg. I literally can’t stop eating this. 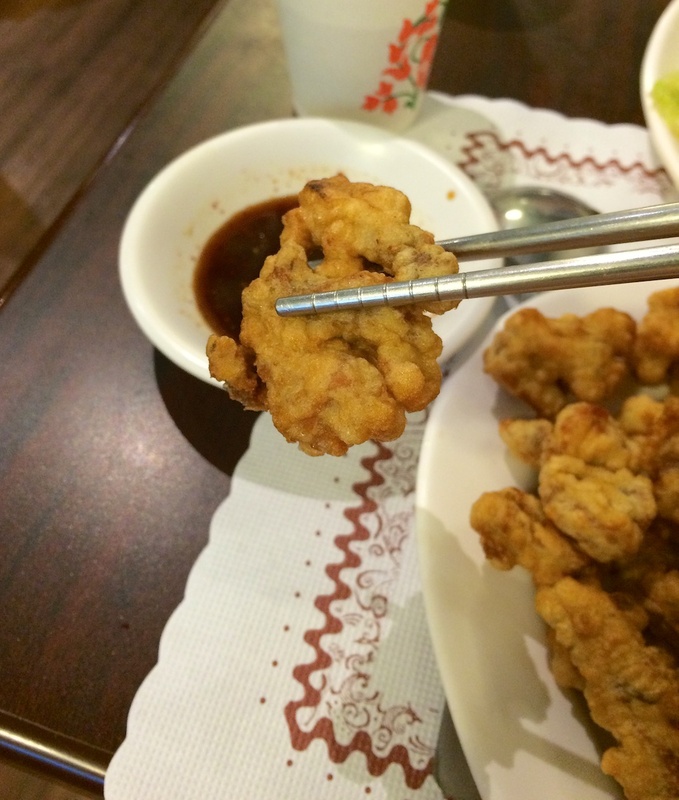 Fried Pork: I accidentally ordered this dish, but I am still glad I got this. 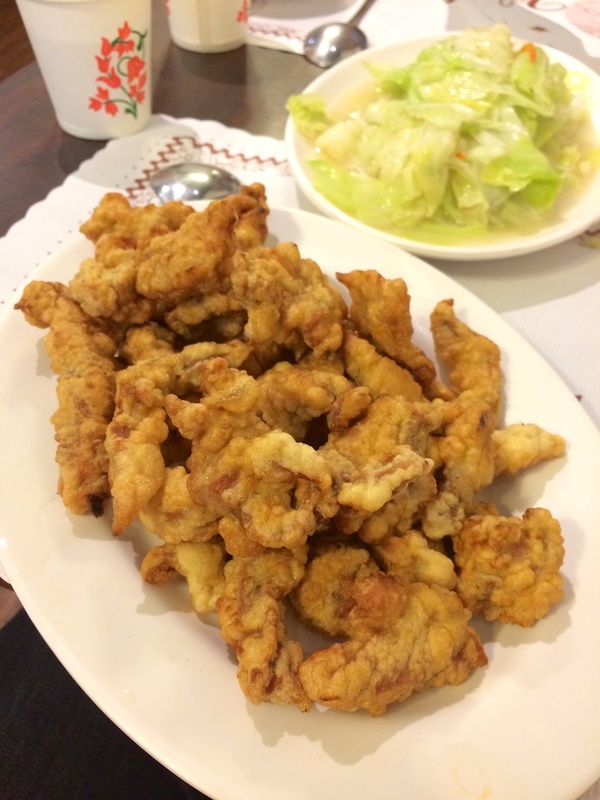 The pork is tender while the fried batter is light and well seasoned. It also comes with a bowl of rice. 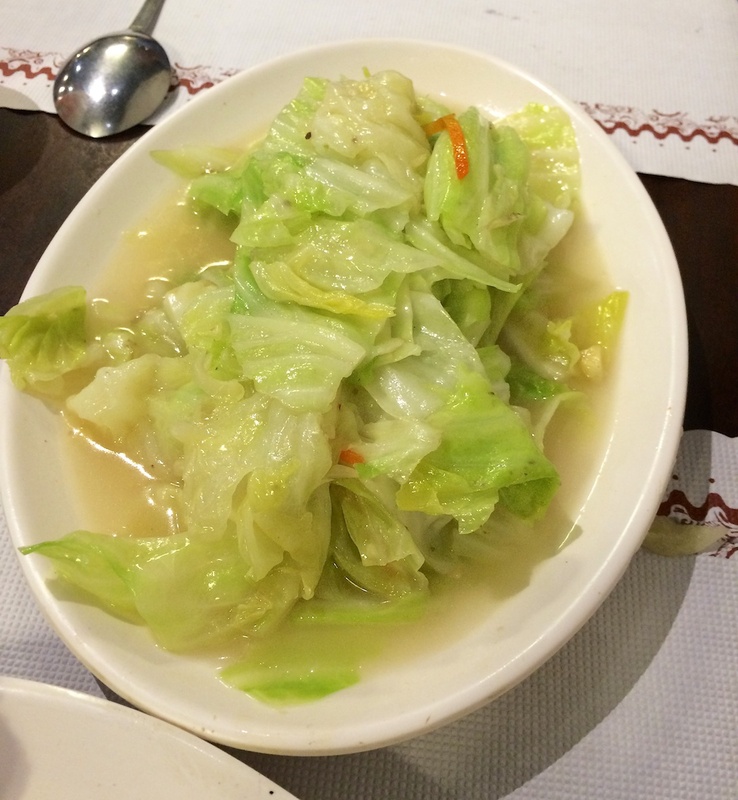 Stir-fry Cabbage: Have to get some vegetables to make this meal semi-healthy. This dish is simple, yet tasty.